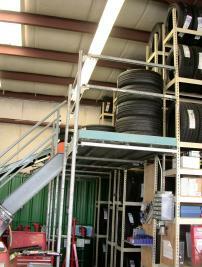 Each Speedi-Bilt Rivet Rack Mezzanine is custom designed to fit the space available in each location. 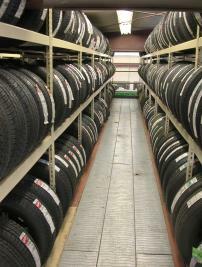 Typically the slower moving tires are stored on the second level with the more popular tires and parts stored on the floor level. 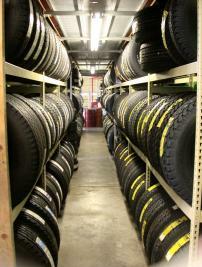 The storage levels are sized to fit the variety of the tires that are stocked, from smaller car tires to light truck and SUV tires. 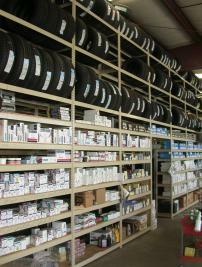 The outer units, closest to the service bays, are fitted with closer spaced shelves for the wide range of parts that are stocked. The aisles are decked with open steel plank grating that allows for HVAC air to flow freely through the mezzanine area. 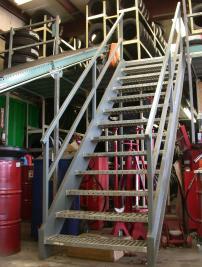 A stairway is provided in the most convenient location for access to the second level.